Aston Villa manager Paul Lambert has hailed striker Christian Benteke as a world-class player, but one that is still far from the finished article. 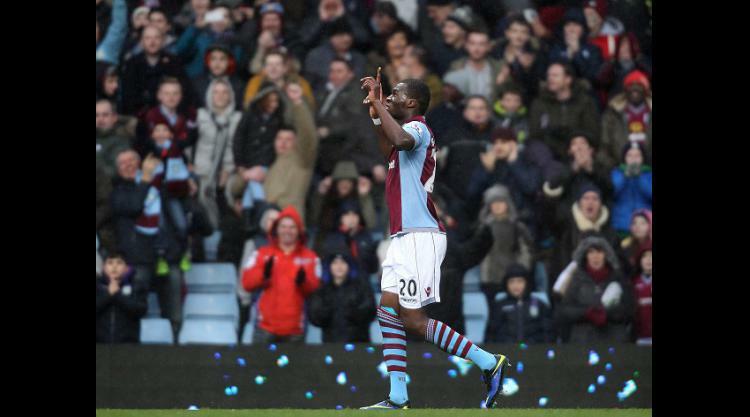 It was always going to be difficult for Benteke to replicate his spectacular debut campaign for Villa last season when he scored 23 goals following his £7million arrival from Genk. Five goals in the opening five matches of this season suggested it was definitely on the cards, but then a hip injury preceded a barren 12-game run and questions were being raised about the 23-year-old. The opener, to haul Villa level after Wes Hoolahan had given Norwich a third-minute lead, was a spectacular overhead volley after taking a pass from captain Ron Vlaar on his chest. It was a devastating spell from Villa with four goals in 16 first-half minutes killing off Norwich, as Benteke's brace was followed by two superb team goals. The four-goal burst followed a dry spell of 351 minutes without finding the net, not that Lambert was concerned. "Against Cardiff (a 0-0 draw), we should have won that game, but David Marshall had one of those nights where he saved everything. He was excellent," said Lambert. "Against Newcastle (a 1-0 defeat), there wasn't too much wrong, other than getting that little finishing touch, but against Norwich it all came together. "We're going into the games with a lot of confidence, but we didn't look a team that was low on confidence. That was the pleasing thing. "I knew if everything clicked then we would score, and if we continue performing that way then we are a massive threat." The club, meanwhile, have confirmed midfielder Chris Herd will be unavailable for selection for the foreseeable future for personal reasons. Herd, who has only made two appearances this season, has already pulled out of a training camp with Australia this week. Australia coach Ange Postecoglou said: "We have been made aware Chris will be unavailable for selection at club level until further notice as he works through some personal issues. "We will respect that and have replaced him in the squad for the Ecuador game." A Villa statement read: "The club can confirm that due to personal reasons Chris Herd will be unavailable for selection until further notice. "There will be no further comment and we request that Chris' privacy be respected."